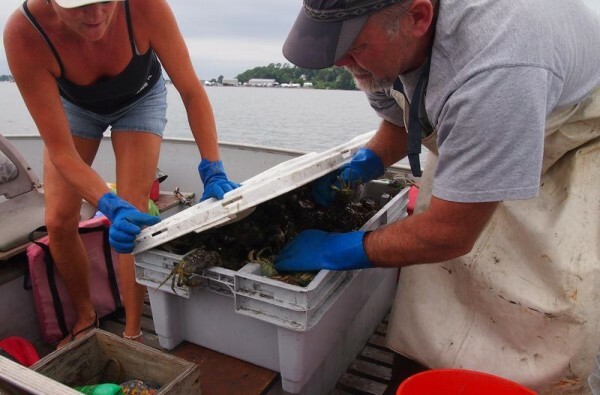 Clint and Andrea Goodenow of Freeport attempt to shut the lid on a bin full of the invasive species known as green crabs caught Monday as part of a trapping experiment in the Harraseeket River. Freeport clammer Clint Goodenow pulls a green crab trap out of the Harraseeket River on Monday. FREEPORT, Maine — Clammer Clint Goodenow motored his skiff up to a small white buoy in the Harraseeket River on Monday afternoon and began pulling up yards of rope from the bay floor below. After reaching the end of the rope, he leaned over the side of the boat and plunged his hands into the water, grabbing hold of a black metal trap. In what appeared to be a delicate balance, Goodenow heaved the trap into the small boat, positioned it above a gray rectangular storage container, and flipped open the latch at the bottom. Dozens of European green crabs crashed into the container — some 1 or 2 inches across, others 5 or 6. He then pounded the top and sides of the trap to knock loose the remaining crabs. Three traps later, the 100-pound container was brimming with crabs. Some attempted to spring loose but quickly were snatched up and shut in with a lid. Goodenow, who is part of the largest effort in the state’s history to study the decline of shellfish populations, describes the swarms of crabs he has seen in the last few years like something from a horror movie. “They just boil out of the water,” he said. In recent years, clammers say the rapid growth of the green crabs along sections of Maine’s coast has ravaged shellfish populations, particularly mussels and soft-shell clams. There is concern now that even Maine’s lobster industry may be at risk. The crabs, previously held at bay by long, cold winters, have swelled in number in the past couple of decades because of rising water temperatures that no longer keep their populations in check. The Freeport-funded project now has more than a month of work under its belt, stewarded by town clammers and lobstermen at the direction of scientists. And while the project focuses on green crabs, it will also gather and analyze data on the impact of other factors believed to be contributing to the decline of clam populations: ocean acidification, which dissolves clam shells, and disease. Researchers and fishermen hope the study can find an effective method to reduce the impact of the crab infestation. If it doesn’t, some believe it could spell the end of the state’s $25 million fishery and be disastrous for the coast’s ecosystem. Freeport Town Manager Peter Joseph said clammers working on the project, which involves trapping and fencing off certain areas, are hauling in about 400 pounds of crabs every three days. He said the town hopes the nearly $70,000 study will shed light on how to deter green crabs in a way that can be replicated by other towns. “All marine resources are connected out there, so what benefits us, benefits everybody,” Joseph said. In a recent tour of Freeport’s tidal flats with Coffin and state biologist Pete Thayer, Kanwit said the crab invasion seems to have reached a new level. 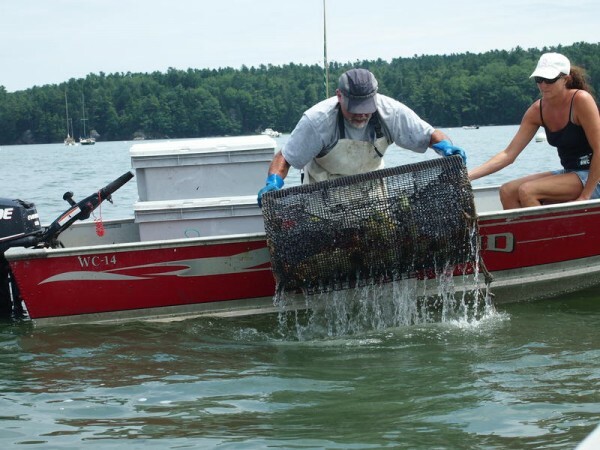 Kanwit said in recent years clam predators such as green crabs and the moon snail have completely shut down commercial harvesting in the once productive clamming area of Northern Bay in Penobscot. Although the crabs are known for eating the juvenile clams, also known as spat, Kanwit said she found “fairly large clams” at entrances to the Freeport flats with chips taken out of their edges, suggesting that some crabs have moved on to larger prey. Right now, the crabs’ favorite meals are clams, but Coffin warns other species, including the Maine’s most sacred seafood, may be at risk. Kanwit said in lab tests pitting lobsters against green crabs, the crabs have dominated. They don’t have evidence of this phenomenon in the wild yet, she said, but lobstermen are reporting catching green crabs in deeper water than they have ever seen. Richard Wahle, a University of Maine professor who studies marine life in New England, said finding the crabs in deeper water is a disturbing development. Another alarming result of the green crab invasion is the erosion of salt grass, an important stabilizing plant, along the riverbanks, said Brian Beal, a professor at the University of Maine at Machias and lead researcher of the Freeport project. Beal, who has studied green crabs since the 1980s, said the only evidence he has seen of this kind of erosion is in a photo from the 1950s that hangs on his office wall. A marine warden stands in the marsh with a hatchet he used to chop away the dead sod that had been eroded by the crabs. Back then, water temperatures soared, creating a fertile environment that fostered a surge of green crabs eerily similar to the one today. The crabs devastated clam populations until a severe cold snap settled in during the 1960s, effectively killing them off and allowing shellfish to return. The concern now is that extreme increase in water temperatures is not part of cyclical process, but an unnatural phenomenon, said Wahle, who published a paper in late June about water temperature’s impact on lobsters. One of the most serious threats thought to be caused by the warming temperatures is shell disease, he said, noting that in the last few years they’ve seen a ten-fold increase in parts of Maine. And while relatively long-term impacts of climate change can seem abstract, Coffin, who has been ringing the alarm about green crabs for several years, said their impact as a result of a changing climate is something that can be seen immediately. Now, he said, clammers and lobstermen in other towns, who at first dismissed the problem, are beginning to pay attention.